Prior to the start of the third Industrial revolution, learning and acquiring skills was more or less a personal journey. Engineering, art, literature, craft and trade were passed down from one generation to another. This process ensured the survival of such forms across generations, and ensured that skills also get refined and adapted over the changing needs of time! But it did have a serious disadvantage: scaling (as in mass adoption) was limited and acquiring of skills across generations were often confined to lineages and patronages. The third industrial revolution, which transformed and disrupted economic models, enabled rapid and mass manufacturing. It also created the need for mass skilling, so that a large percentage of the population could be employable in the wheels of the new economy, since mass manufacturing required people with repetitive skills and processes. This created a greater need for more structured forms of education. The ability to spread knowledge to the masses via print media was a key enabler to this process. All of the above, over the next 200 years, led to the growth of schools, curricula, professional colleges, and industry specific courses, that were all designed to cater to the mass. Given the focus on mass education and skilling, the process of focused internship and personalized mentoring, quite often took a backseat, barring the few areas that survived, particularly the ones related to niche arts and crafts that could never be replaced via mass skilling, and necessitated a personal touch or a human connection all along the journey. Mass classrooms, with slotted periods, calendared lesson plans, measurements and progress gated via template-based assessments, standardization of these with certifications and degrees could not accommodate the personal touch and the associated measurements of potential. Talents who were alternate thinkers, talents with special needs, and talents that were super intelligent, were all lost in these mass skilling programs. We are now at the start of what is being called as the fourth industrial revolution. Machines are evolving faster, communication is becoming faster and cheaper, AI and Machine Learning is progressing rapidly, and manufacturing and factories can now literally run by themselves! There is no doubt that automation and AI will take away a major portion of existing jobs. Be it a doctor, engineer, teacher, people in armed forces, nurses, lawyers, stock market traders, all of these jobs are at risk, via automation. Work, or being engaged productively, for the purpose of living as well as to keep our sanity intact, is one of the most essential needs of human beings. We are not a trivial group of living organisms, having now reached seven billion and slated to reach eight and a half billion by 2030. In brief, Education 4.0 is the ability to combine the power of technology, the need for directed and specialized skilling, the ability of Artificial Intelligence and Machine Learning to understand students’ needs and combine all of these to create a method that will deliver the highest quality custom content, in a self-paced, anytime/anywhere manner, to the learner. It gives teachers, students and educators access to the best content from across the world, in a boundary-less manner. Education 4.0 can ensure that what is being learnt will meet the future needs of the workforce and skills. This is important since the future economic model is shifting from mass rapid manufacturing and solutions to more customized and personalized services. Mundane tasks are also being replaced by machines and AI and Robots. Details of these are in the articles referenced below. So what does that mean for learning? What does it mean for mass education? What sort of shift will happen? What follows below are trends and thoughts in this evolution, given that this is still a highly debated and evolving topic across countries. Disruptions happen, when a critical mass of adoption happens. 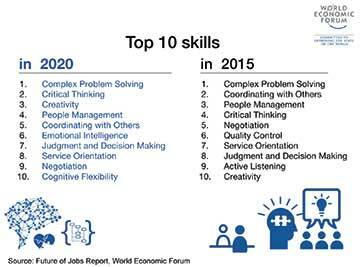 According to the World Economic Forum, here are the areas related to skills that will shift by 2020. At the top of the 2020 chart, the top three skills are the ones that require creativity and deeper thinking, and not mass employability related. Classic skills that are highly paid today are moving down the list, and may soon be on their path to obsolescence. Building on my previous articles, referenced as listed below, we can also notice that several of the core sectors that are part of the third industrial revolution are now shifting. For example, manufacturing is moving to 3D printing. 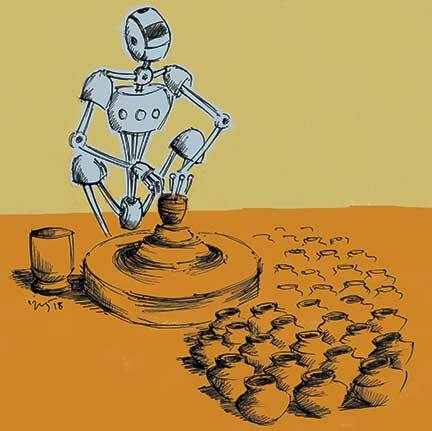 Many experts in Robotics and AI are predicting the “Singularity”, a state where machine intelligence surpasses human intelligence, and where machines will do the bulk of the repetitive tasks. Social media is helping spread informal learning, and their power to mass spread peer to peer learning is already a reality. There is also a serious need for art and social science related fields to evolve. The Education 4.0 framework has the capabilities to enable this. This can now be seen spreading; arts, music and literature classes are now available online, in a very effective and experiential way, and more of these are coming online, from the best contributors from across the world. No child wants to spend nearly nine to ten hours a day cooped up in a classroom. A child’s mind is explorative, and wants to touch and feel. Mixing modes that involve some amount of gaming and learning can be an effective way to address this. Project based and collaborative learning is the key. Collaboration and competition are different; today’s system promotes a lot of personal competition, in the formative years. Industry and future jobs will need a lot more collaboration, and instilling that aspect in the formative years is the right step. It is important for schools to realize that today almost all the content related to structured learning is available freely online. Hence, the school as a place to formally learn such things could be a thing of the past. Would this mean that in future, schools will be more like experience zones? Can students break out of physical classrooms and grade based segregation? Is this already happening? Finland is a great example of this concept, where starting from the primary grades, the concept of boundary-less classroom and subject-less teaching and learning methods have been introduced. An excerpt from this effort: The aim of this way of teaching – known as project – or phenomenon-based learning (PBL) – is to equip children with skills necessary to flourish in the 21st Century, says Kirsti Lonka, a professor of educational psychology at Helsinki University. Among the skills she singles out are critical thinking to identify fake news and avoid cyber-bullying, and the technical ability to install anti-virus software and link up to a printer. Closer home in India, there are alternate schools that are experimenting with such models, and have been partially successful in getting acceptance from the student and parent community. Skill shifting is rapid and parents must play an active role to understand how to tap into these trends and help mould their child. As children begin to adapt rapidly to technology and start learning on their own, parents can act as guides/facilitators, moderators, and also content creators. As things move more towards project and phenomenon-based learning, a large percentage of learning will happen outside the classroom. All this means that the traditional way of parents outsourcing learning to formal and structured schools will vanish, and a new form of collaborative learning will evolve. Learning in a formal environment brings in a certain amount of discipline and methodology. We are all used to that for a few hundred years now. Schools and colleges are way beyond structured learning. The bonds of friendship that we develop during these days often form the social fabric that we carry for life. We can see that in the multitude of school and college day reunions that are happening all over the world! A society that moves into adoption of technology and non-school or informal forms of learning hence must be able to create that social fabric, around which learning happens. It could be the large living community of a city, or the smaller communities in our towns and cities. As we move towards micro communities, the local community can have a much larger role to play in promoting and owning education. Satellite centers within the communities can be an option. Volunteering as teachers and facilitators can be the other. Local projects around technology, environment, sustainability, community planning, etc., can add very rich experiences to the learning of a child. EdTech is a mass enabler of education and knowledge. That is a huge opportunity for transparent education and technology as a tool to lift society and democratize education. It is also an enabler of providing the right skills at the right time, thus providing means of livelihood and near full employment. On demand trainings can make the courses much more affordable, and thus keep ready a skill pool, that is always available. The role of the teacher who will now transform into a facilitator stays. These numbers are not small, and it is important to be included in the policy making of the government, and the associated budget allocations and planning cycles. For example, the government can create a public-private partnership model, where the government can create the framework and private players can create the facilitators of learning. Building future ready infrastructure is a critical part of this. Broadband and mass adoption of digital devices needs huge investments. The affordability of these can be another area where the government can step in and enable. This is imperative and there is hardly any choice left. The earth is already stressed and cannot accommodate any more consumption without replenishment. All models of future education must incorporate and deeply ingrain this thinking. At the current rate, human population is predicted to be wiped off in about 100 years! Most of the large technology companies are doing serious research in enabling this. IBM and Google are in the forefront. Companies such as Microsoft, CISCO, Intel, HP, etc., are also investing big time into these areas. The total investment currently runs into several billions of dollars. The Global EdTech sector itself is predicted to be a 250 Billion USD Market by Year 2020, and is currently growing at about 17 per cent per annum. Closer home, NIOS also provides an opportunity to parents and students whose needs for developing other areas of talent restricts them from attending formal and structured schooling. As on date, NIOS has certified about 3.5 Lakh students in the 10th and 12th grades. The home schooling market in India is also picking up. As of 2017, there are approximately 20 lakh home schooled students in India. Universities are already creating methods for students across the globe to pursue skill-only programs and also more structured Master level programs, without being part of a physical campus. The most popular one in the school space is Khan Academy. At the University Level, and senior high school level, many free sites provide top class content for students to learn on their own. Education 4.0 is here and is rapidly evolving. There is no getting away from it; the wheels have been set in motion. As with any disruption, this will also go through the circle of resistance, pain, course corrections and adoption. As that happens, it is important that students, teachers, parents and governments, and the millions of enablers in this disruption, closely work together, to make the transition happen in a smooth manner. And in that process also ensure that children get to learn what they are good at, become healthy and collaborative citizens and ensure that the earth and its other fellow living beings and creatures, continue to harmoniously exist, for the next several millions of years. The author is the Director and CTO of CREATNLRN, a venture focussing on creating an adaptive and interactive learning platform for high school students. He can be reached at uponnadi@gmail.com.